The governorship candidate of the All Progressives Congress (APC) in Ebonyi State, Senator Sonni Ogbuoji, has accused the state governor, Chief David Umahi, of bribing the military and other security agencies in the state with operational vehicles. He said that the vehicles numbering about 70 which were distributed to the security agencies in the state were daylight bribe. Governor Umahi, on Tuesday, distributed some vehicles to the security agencies and charged them to up their ante in the fight against crimes in the state. Umahi clarified that the vehicles were given to the security outfits to assist them in their fight against crimes. He said the kind gesture had no political undertone whatsoever. But the APC governorship candidate viewed the move as hypocritical. He wondered why the assistance was coming a few days to the general elections. In a statement signed by the Director of Media and Communication of his campaign organization, Mr Ikenna Emewu, the guber hopeful also mocked Gov. Umahi, accusing him of playing a double standard. 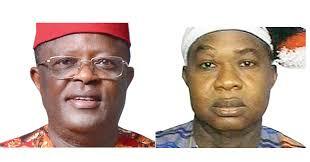 The APC campaign council recalled that Umahi had on January 6, alleged that the launch of the operation Python Dance III was disguised rigging plot by the Federal government using the soldiers. The statement partly read: “How did the same man who called the Operation Python Dance III a ploy by the Federal government to use the soldiers to rig elections turn around after nine days to praise the same group. This is doublespeak and a sign of inconsistency and insincerity. “We want to let Nigerians know that the vehicles Umahi distributed to the military and paramilitary and his recant were from the pressure he faces inside from his wild utterances. “We urge Ebonyians and the Federal government and even the agencies that got the vehicles not to be taken in by his sugar-coated gaffes. His words and gifts are ‘Greek gifts.’ They are meant to induce and subtly coerce. “As we urge the agencies to receive the vehicles and boost their operation, we also want them never to forget that they should be fair to all during the elections while using the vehicles Umahi donated to them. “Those vehicles were not bought from his personal income, but government fund and we urge you to be professional and not to be taken in by the antics of the governor to use them and induce your just service,” the statement added.